You may think of selling your hair for cash as an idea born directly from Les Miserables, but the practice in modern society is much easier and more lucrative than what you may have seen in the classic novel/musical. Even better for sellers, is that the current market is a sellers market so you can get prices anywhere from $250 to $5,000 for your lovely locks. Before we get started with this more interesting of ideas to make extra money, I want to assure you that selling hair is simple, non-invasive, and absolutely legal. If you are trying to decide if this is a good idea for you then you need to acquire some basic knowledge on hair buyers; where to find them and what they are looking for. Either one of these will provide you with a decent market for selling your hair. 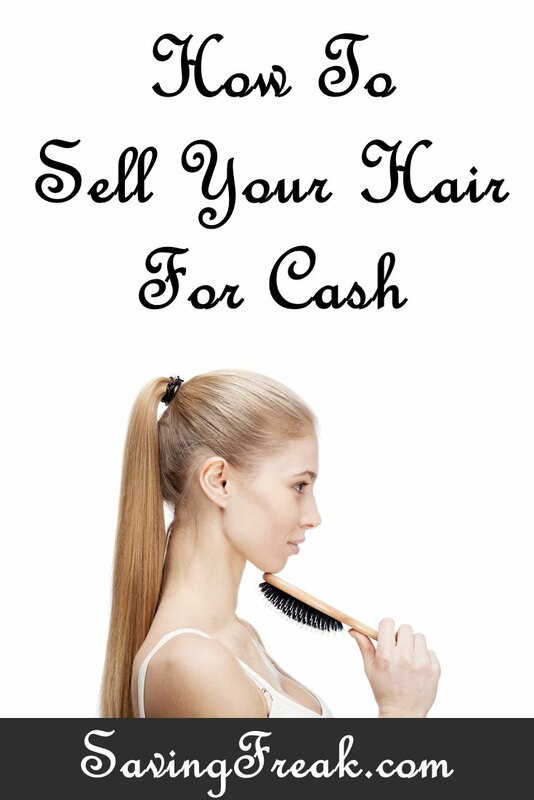 BuyandSellHair.com is the most popular and is a little less expensive at $14.50 for a three month listing. OnlineHairAffair.com will cost you $15 for 61 days. Length – You are going to need at least 10 inches. Since most of us do not have hair that is all the same length, you need to realize that all the hair you sell needs to be at least 10 inches and the same length. The longer the hair the more you can get for it. Health – Think about every hair commercial you have ever seen and do what you can to make your hair be that healthy and thick. This means eating right, exercising, reduce stress, and no smoking. All these things make your hair grow more healthy. Also, keep the split ends trimmed up so the hair grows as well as possible. Genetics is going to play a role here. If you have naturally thin, dull, or frizzy hair you are going to have much harder time getting a good price, or your hair may not sell at all. Virgin Hair – When I was doing the research for this post I have to admit that I giggled a little when I first read this term. All this means is that buyers want hair that has never been chemically altered. That means no dye, bleach, straighteners, permed or chemically altered in any way. Keep you hair as pure as the wind driven snow and you can fetch the best price. If your hair just doesn’t measure up and you are having no luck selling it then I have another idea you can try at the end of this post. Take pictures of you hair while it is still on your head showing it in great light. Also, using a tape measure to show thickness and length is recommended. Go to the site and post your ad. Make sure to include an honest and detailed description to help buyers feel like they are getting the best information. Once you have a buyer I would recommend using PayPal because it provides the greatest security for you and the buyer. Do not put yourself in a situation where you receive payment only after the buyer receives your hair. Once the payment has cleared through PayPal send the hair to the buyer via an agreed upon shipping method. You will want to purchase insurance and require a delivery confirmation (signature). This also gives you seller protection through PayPal. On average your hair grows about half an inch a month. To make this idea a more than once every 20 month proposition you can try doing a few things to help your hair grow faster. While I am no expert in the art of hair growth, I think this article from Good Housekeeping could be helpful with getting your hair to grow at the fastest rate possible. Once you get on the websites and get a feel for what buyers are looking for you can coordinate other people selling their hair. You will need a good camera that can take top quality pictures and a little skill at getting good light on others hair. Set reasonable commission rate for yourself (I think 20% of the selling price is a good way to go) and get as good as you can at putting in truthful descriptions that will help the hair to sell more quickly. If you can get 15-20 women with great hair to work with you then you can make pretty good money each month. If none of this works for you but you would still like to help someone who needs your hair check out Locks of Love. It is a non-profit organization that creates top quality wigs and gives them to disadvantaged children who experience hair loss as a result of a medical condition. The vast majority are cancer patients and it truly is one of the great charities that really makes a difference.